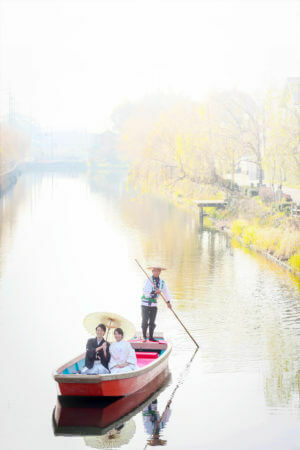 Yanagawa is famous with boat riding. We usually go downstream in a boat but for the wedding, we go upstream!! 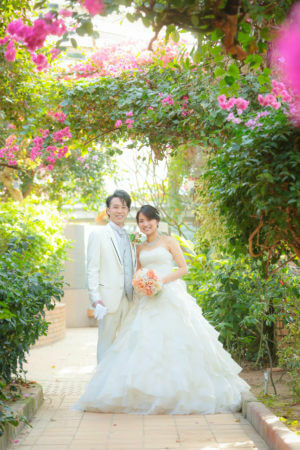 Many customers who are originally from Yanagawa choose this shooting package. I would like to introduce this Yanagawa package with the beautiful smile. The wedding boat will have a red carpet that really matches the white wedding Kimono. The couple kept their smile under the cold weather! Time flows slowly on a boat. Wonder what they were talking..
We took a shot with “Sagemon”, a famous Yanagawa tradition for Hinamatsuri. Perfect for them since their wedding was on Hinamatsuri. Next is a dress shooting. 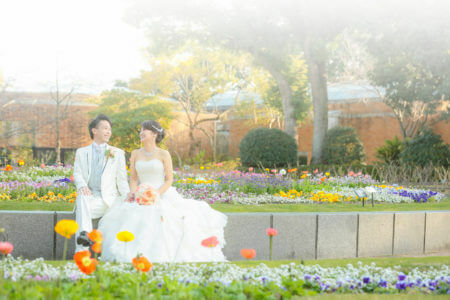 We chose the botanical garden since it was raining, and also we are able shoot with many flowers even during the winter. 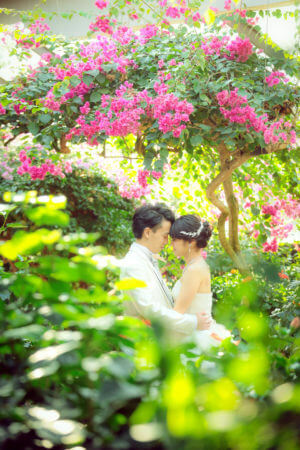 The indoor garden was full of pink bougainvillaea. The bride was very happy because she liked this flower! Besides the indoor garden, there are many flowers in bloom. We shoot from distance to capture their natural smile too. We enjoyed the shooting since they were always smiling. Wish them a happy future and many more!